David B. Smith, Sampler (installation view), 2018. Left: Large Flag 2, 2018, Digitally woven cotton with wool, cotton, and acrylic threads on wood stretcher, 70 x 50 inches, $7000. Right: Medium Flag 2, 2018, Digitally woven cotton with wool, cotton, and acrylic threads on wood stretcher, 42 x 33 inches, $3500. David B. Smith (b. 1977, Washington, DC) holds and MFA from Bard College and has been awarded residencies by Apex Art, New Zealand; Harold Arts, Ohio; Waterpod and the BOFFO residency, New York. Smith’s work has appeared in exhibitions at MoMA PS 1, The International Center of Photography, Yancey Richardson Gallery, Asia Song Society, John Connelly Presents and Halsey McKay Gallery. He lives and works in Brooklyn, NY. Planthouse is pleased to announce Sampler, a solo exhibition featuring the works of Brooklyn based artist David B. Smith. 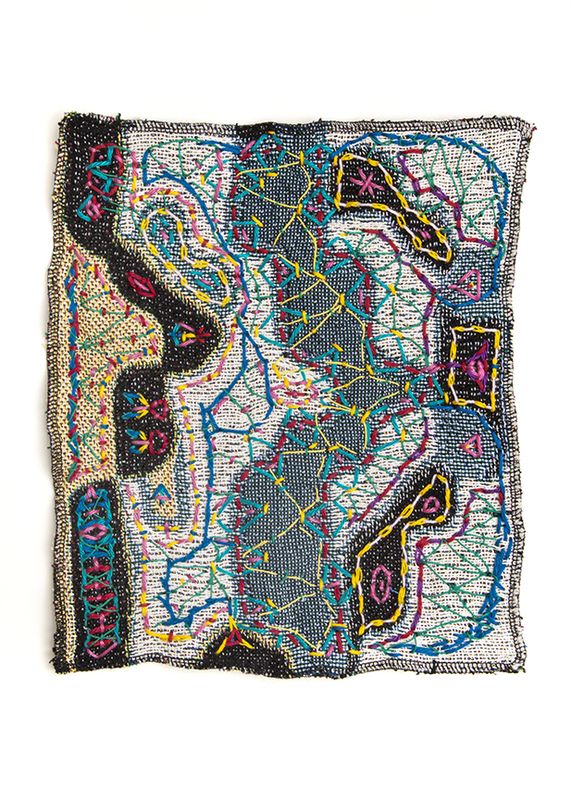 Inspired by his participation in Planthouse’s 2017 exhibition of artist-made flags, Say a Little Prayer for U.S., Smith has continued to make ‘flags’ by fervently embroidering digitally woven cotton of his own design with wool, hemp, acrylic and other threads, mirroring the act of prayer through an extended interaction with each piece. Smith begins by cutting leftover fabric from his soft sculptures and collages into roughly equal sized rectangles. While planning how to interweave various colors of thread, he feels commitment but also doubt, as a certain amount of time and effort without a known outcome is required. He focuses on one thread at a time to move forward, repeating the process of reflection, addition and transformation until the piece feels autonomous, settling into a place between dissonance and harmony, like a state of consciousness. The finished works are primordial patterns, stories, and spaces that relate to systems such as blood flow, the internet, memory, genetics, social structures, skeletons, economics, plant roots, identity, and politics. Each flag is a proposition for reality—a symbol for and a window into a different world. They activate layered and blended fields of interweaving connections, speaking to the way worlds and ideas form and evolve. David B. Smith is a multi-disciplinary artist combining photography, textiles, sound and sculpture to unravel the interconnected nature of embodied subjectivity in an increasingly digital world. He has been awarded residencies by Apex Art, New Zealand; Franconia Sculpture Park, Minnesota; Marble House Project, Vermont; Socrates Sculpture Park, and BOFFO in New York. Smith’s work has appeared in at MoMA PS 1, The International Center of Photography, Halsey McKay Gallery, Asia Song Society, among others, and is featured in Fired Up! Ready to Go! : The Collections of Peggy Cooper Cafritz.